Turned screw mount for supporting the theodolite, fitting inside a sleeve with a clamping screw working on a knurled edge. This rises to an altazimuth mount with clamping screw for a diametric bar which supports the horizontal circle. The rotation of the bar can be clamped by a screw and the circle is secured to it by two screws with pierced heads. The horizontal circle, in the form of a ring carried by an open cross, has an outer degree scale 0 to 360, divided to 10, subdivided to 5 and to 1, numbered by 10, and an inner scale of hours 1 to 24, divided to 1, subdivided to 1/2 and to 1/4 with alternate hatching. 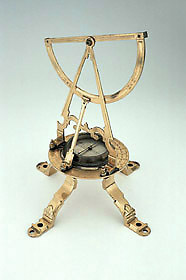 A central glazed circular compass box, not rotating with the vertical semicircle, has lines for the four cardinal directions, marked 'SEPT[Ebar]TRIO', 'ORIENS' (to the right of north), 'MERIDIES', 'OCCIDENS', and a target line offset for variation; steel needle with brass cap to mount. A diametric bar rotates around the circle with two short uprights at either end with holes accommodate fixing studs at the lower ends of the 'A' frame rising to the pivot for the vertical semicircle; the studs are secured by hinged clamps . A third arm, at right angles to the diametric bar, is for supporting the lower end of a lateral reinforcing strut rising to a hinge on the semicircle; this strut is missing. The 'A' frame has a scrollwork cross piece, with a plumb-bob stowed in a screw-hole in the centre. The vertical semicircle is decoration with mirror gilding on one side and on the other a degree scale 0 to 90 to 0, divided to 10, subdivided to 5 with alternate mirror gilding and to 1, numbered by 10. Circle and circle-centre sights at either end of the diameter of the semicircle. The motion of the semicircle is constrained by two clamping screws. The vertical framework can be removed and replaced by a shaped rule extending beyond the horizontal circle, so that without the mounting beneath the circle, this can be used as a protractor. The scale on the arm is 0 to 24, divided to 1/2 with alternate hatching and to 1/4, numbered by 1.